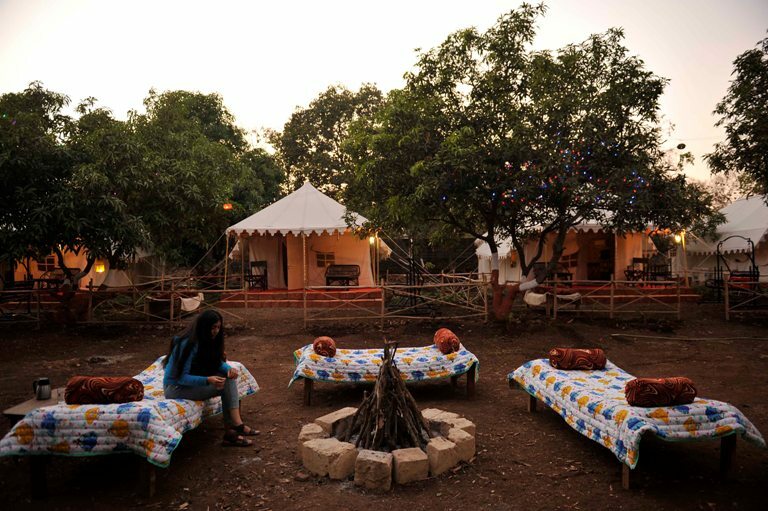 About " CAMP LEO " at " GIR PRIDE RESORT "
We are a part of 30 acre self sufficient Farm. We are more of a jungle theme resort not a professional hotel. We don't sell rooms! We connect you to nature! We promote adventures and share our wild life experiences with you. 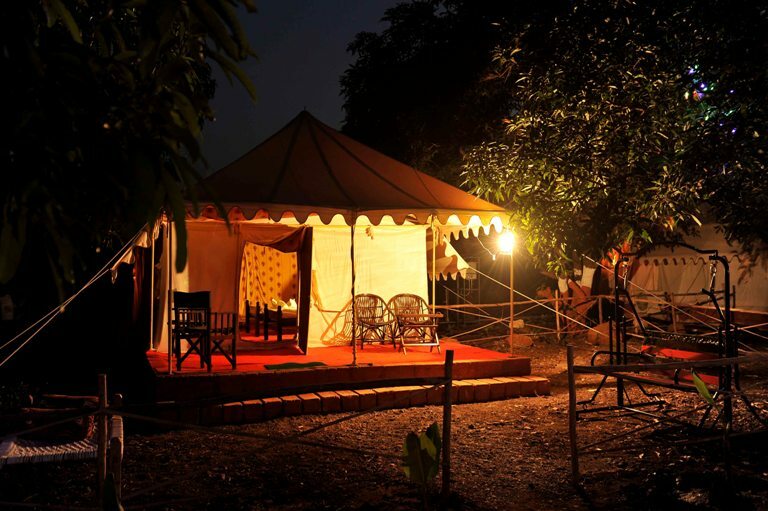 We are one of the oldest, eco friendly and valid licensed property in Gir! We don't boast a great luxury. We don't have lush green lawns or manicured gardens, simply because its not a part of true wilderness. We don't have formal uniformed staff or professional help desk or travel desk. We promote adventures and expose you to various wilderness activities. We connect you with nature. We are basically a jungle theme resort with wonderful activities. We are a small, quiet, self sufficient, simple jungle like camp accommodation. We have a blend 10 Swiss AC Tents and a small Bungalow with 4 AC rooms with Balcony and 5 rooms on ground floor with sit out area. 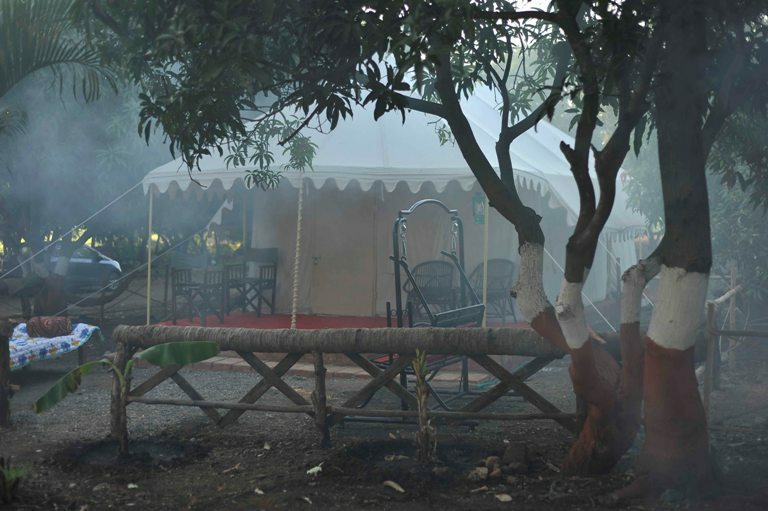 On top of the bungalow we have two non Ac room to accommodate budget families up to ten person in each. 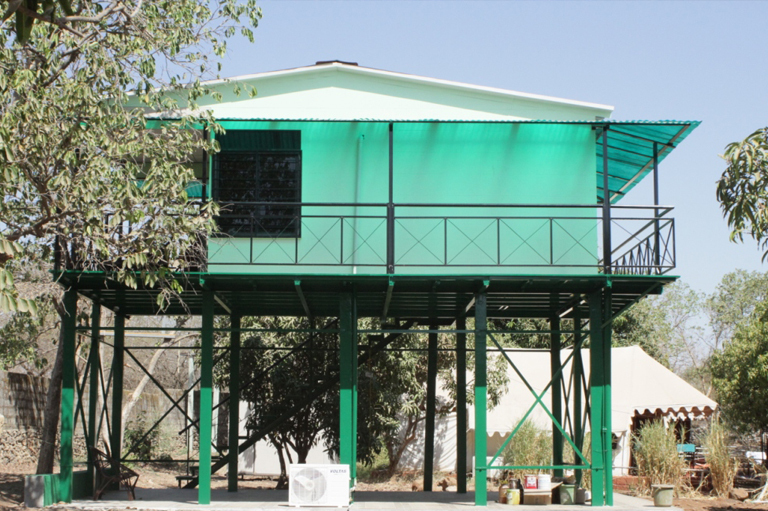 We have a Lovely Elevated House, ten feet above the ground, to give you real jungle feel. with children's play area, adventure sports, jungle rides, a great 40 feet machaan, a double storeyed 25 feet watch machan and photography point that offers you privacy, peace and a great holiday experience too! We are self-sufficient for our major requirement of dairy products, crops, fruits & vegetables! We grind out own flour for the day! We cook on fire wood! Unlike other hotels we don't have many rules or sign boards around. We also grow ground-nuts, sugarcane, wheat & pulses like grams & maize. We grow our own onions, potatoes, tomatoes, garlic, cabbage, cauliflower, brinjal, carrot, radish, beans, beetroot. Ever wonder..we even have jain potato & jain garlic!. Our fruits like Kesar mango, jambu, chikoo, sour lime, coconut, banana, grapes, papaya are very popular for our visitors. We promote Kathiawadi culture and Kathiawadi cuisine. We are also professional with an exposure of cultures from around more than one hundred countries !! BUT YES, TRADITIONALLY WE ARE INDIANS AND WE ENSURE WE KEEP OUR TRADITIONS ALIVE. This property is professionally managed by Empowering Hospitality Pvt Ltd & Nomadz India Pvt Ltd. Mr Mahendra Sinh Solanki, the director, is an Ex British Merchant Navy Officer with passion for Wild life, nature and wilderness conservation. 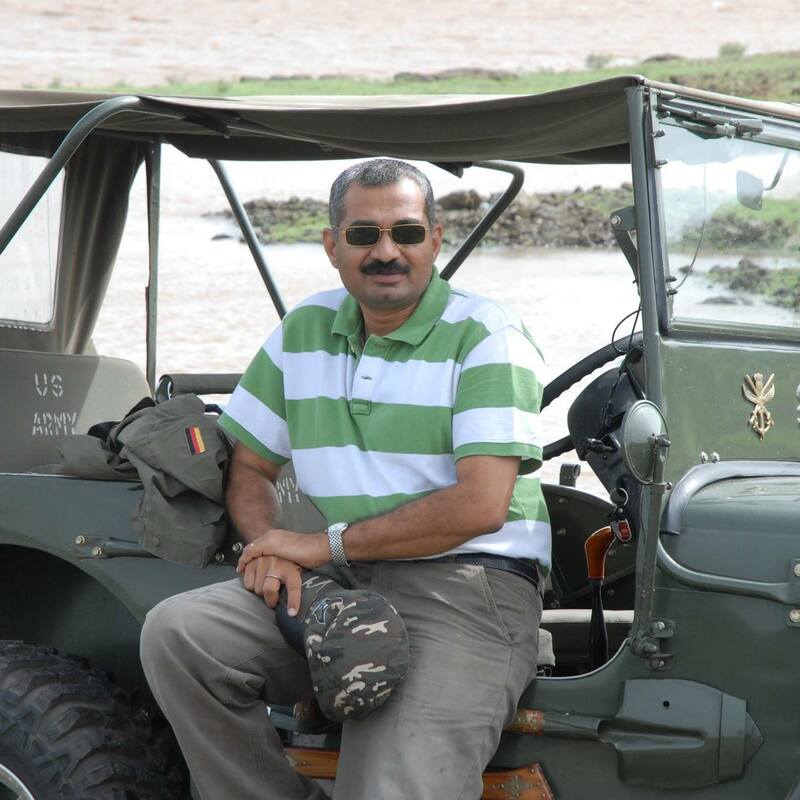 He is a Hotel Management professional, hails from Lunawada and presently resides in Ahmedabad. He has varied background of more than 25 years in various Hospitality sectors and by virtue of his profession, has circumnavigated the World couple of times. While managing Cruise Line Ships, he has been exposed to more than a hundred countries and has exposure of various hospitality cultures! 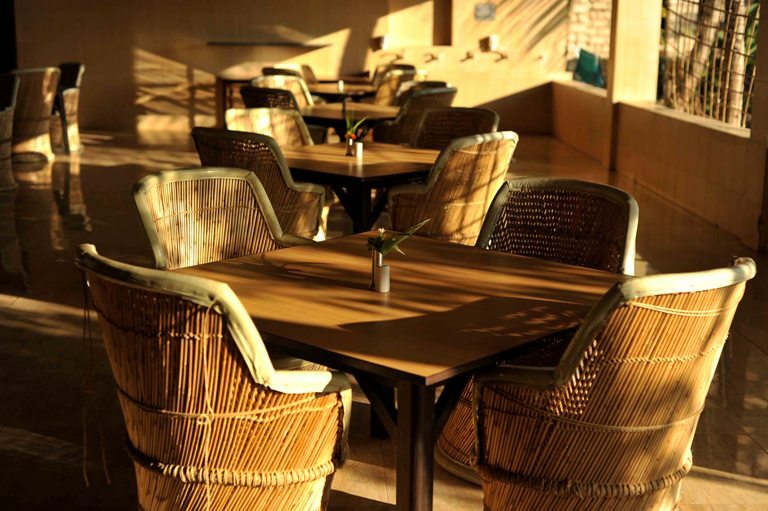 Mr Solanki is a Hospitality consultant and works on Budget hotels and Resort Hotels. For past fifteen years he has been actively chasing his passion for wild life and has gained expertise in handling any types of snakes and reptiles. For now he is studying Lions at Gir! "CAMP LION" is his first passion project! He is exploring possibilities to open few more at Somnath, Diu, Porbander and Dwarka. Want to get associated? Welcome.